Breeding is an efficient tool to reduce the use of antibiotics in dairy production. Results from Norwegian Red show that dairy production with almost no use of antibiotics is possible. Good genes for animal health will probably be even more valuable in the future as antimicrobial resistance is increasing globally. Antibiotic resistance is a serious and growing problem globally. The Worlds Health organization (WHO) recently (April 30, 2014) published a report: ”Antimicrobial resistance: global report on surveillance 2014”. The report states that antimicrobial resistance is an increasingly serious threat to global public health, and that a post-antibiotic era— in which common infections and minor injuries can kill—is a very real possibility for the 21st century. A global healthy security treat like this call for action, and we may have to change the way we use antibiotics also in livestock production. A report from the European Medicines Agency on the sales of veterinary antimicrobial agents in 25 European countries (January 2014) shows that Norway has the lowest use of antibiotics per kg produced livestock biomass among these countries. Livestock production in Sweden uses almost 4 times, Denmark 10 times, Germany 50 times and Italy 100 times more antibiotics per unit produced product than Norway. The favorable situation in Norway is a result of action taken by the Norwegian farmer’s organizations decades ago aiming at reducing the unnecessary use of antibiotics. In dairy production the treatment strategies changed, the Norwegian Cattle Health Service was established, mastitis control programs, advisory- and herd management tools were developed, and the weight put on health traits in the breeding program for Norwegian Red increased. This joint action worked and the effects are illustrated in Figure 1. 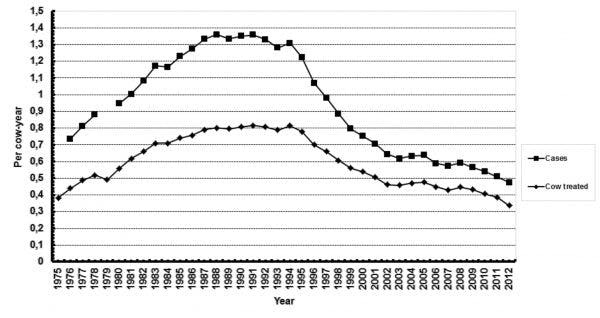 The total number of veterinary treatments per cow and year was reduced from 1.3 in 1990 to below 0.5 today (Figure 1). The main reason is fewer cases of clinical mastitis. Mastitis and other diseases have been included in the breeding objective of Norwegian Red since 1978, and significant genetic improvement has been achieved. The genetic trends for mastitis and other diseases in Norwegian Red show genetic improvement after 1990. The genetic change for mastitis over 20 years (from 1990 to 2010) was on average 0.4 index points per year. Thus a considerable part of the reduction in veterinary treatments (figures 1) is due to genetic improvement. Today’s Norwegian Red cows are healthier and have better genes for disease resistance than the cows we had 25 years ago. Results from a selection experiment with Norwegian Red illustrate that it is possible to obtain large selection response for clinical mastitis if enough weight is put on the trait. After 5 cow generations the genetic difference between the 2 lines, selected strongly for high protein yield and low mastitis incidence, respectively, was about 10%-units clinical mastitis. Selection mainly for mastitis for 25 years had large effect. The low mastitis line of the selection experiment may arguably be the healthiest dairy cows in the world and demonstrates that dairy production with almost no use of antibiotics is possible.